Azendoo has gone through many changes over the years, and some big ones recently with exciting new features such as Time tracking and Task boards. We have always valued the design of Azendoo, and it is often one of the elements that most differentiates our application when compared with similar software. However we noticed that some of the recent changes increased the blur between the separation of personal and team work. This is why we are announcing an important navigation change to clarify the separation of your work and teamwork in Azendoo. Oh, and to make Azendoo even more personal, we added themes! Azendoo is evolving to become even more relevant to your personal and team work. Your work inside workspaces is now divided into two separate spaces: My work and Teamwork. 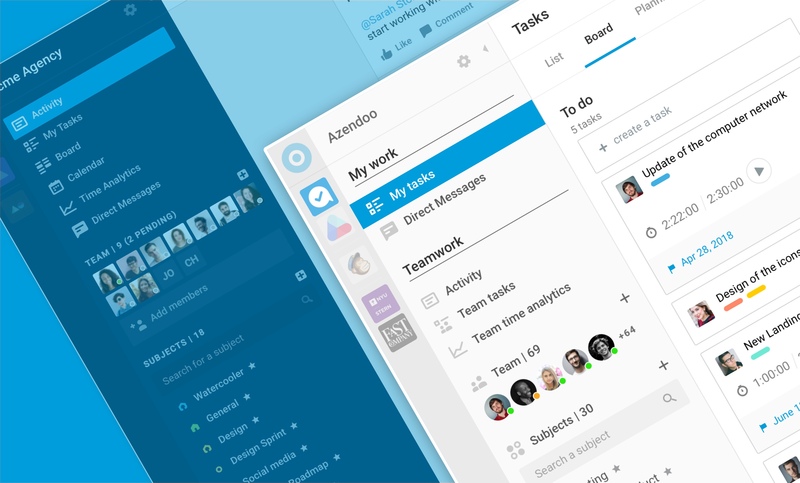 The My tasks and Team tasks buttons now bring together all the different ways to display the same tasks, whether they are in task lists, task boards or task calendars. The navigation is now similar to that of the subjects view. The Lists, Boards and Calendars are now tabs displayed at the top of the screen. The new My work section is composed of two elements: My tasks and Direct messages. My tasks groups all the views available for your tasks: Lists, Board and Calendar views. The List tab is where you will find your personal task lists containing your To-do, Snoozed, Canceled and Completed tasks lists, along with your tasks by Due Date. The Board tab is the equivalent of your To-do list, displayed in a kanban view and with separators acting as columns. The Calendar tab displays all your tasks that have a due date. The Teamwork section is composed of the Activity, Team tasks and also Time analytics if you have Time Tracking enabled. The new Team tasks page is composed of different views for tasks, similar to the My tasks section. There are currently only the List and Calendar tabs, but we are have plans to add the Board tab to bring relevant team-wide task boards to you soon. Let us know what kind of team board you would like to see to help us shape this section! The team task lists have changed quite a bit to bring insights on tasks to you and your team members. The To-do is now sorted by last updated, meaning that the tasks that are currently being worked on by your team appear at the top. This list includes unassigned tasks as well, so you can use this list to have a feel of the work being done by your team. The Planned and Due dates lists haven't changed and list all tasks with planned or due dates, ordered by date. The Assignee list is your team to-do sorted by team member. Unassigned tasks are not included in this list and have their own list now. The Unassigned list is new, and is ordered by last updated. This list will give you insights into which tasks might need an assignee to follow through to completion. The Subscriber list regroups all tasks you are subscribed to and is now also sorted by date of last updated. Similarly the idea is to have the most active and recent work at hand first. The Canceled list is now ordered by Cancellation date instead of date of last update. The Completed list hasn't changed and lists all the team completed tasks ordered by completion date.